I recently came across this pin from Amandeleine.com. 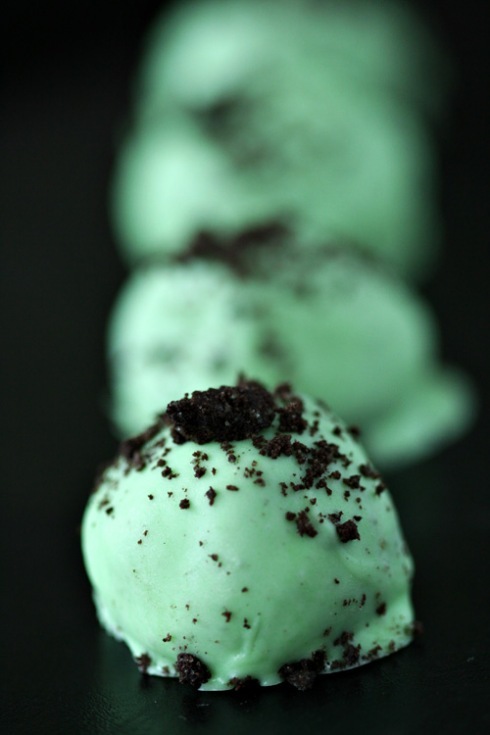 It is a mint twist on the Oreo truffles I made a few weeks ago. Since I loved how the original truffles came out & since I love mint (especially mint chocolate chip ice cream! Yum! ), I figured I’d give it a go. Start by crushing up a whole package of mint flavored Oreos. Side note: I’ve never had the mint flavored Oreos before, but they are quite tasty! Mix the Oreos up with an 8oz package of softened cream cheese. Then form 1 inch round balls out of the mixture. Put them in the freezer for 10-15 minute to make them easier to dip. Now it’s time to dip them in the chocolate. This recipe calls for melted white chocolate mixed with a teaspoon of peppermint extract and green food coloring. Unfortunately, I’ve come to realize that my dipping technique has gotten worse with every item I make instead of better. I couldn’t get my truffles to look nice once dipped. I think it might be because the green chocolate is less forgiving then the dark chocolate. Although my truffles didn’t come out looking that great, I did gain a nice green thumb. I’m sure my office plant will appreciate that. The final step is to place the dipped truffles in the fridge for an hour or so, to let the chocolate harden. The Verdict: A nice twist to the classic Oreo Truffle. It was easy to prepare and delicious. I just wish they looked a little nicer. But, I would definitely make these again. 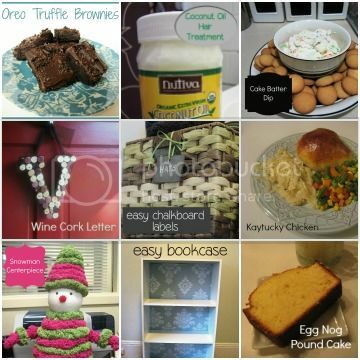 A great treat for the holiday season! Things to Note/Consider: Make sure you have enough white chocolate. The recipe calls for 12 oz which was not enough for me. Luckily, I had a candy melt stash that I could break into to cover the rest. Also, I forgot to save some Oreos to garnish with. I think that might have made them look a little nicer.